I am finishing my packing and getting everything into the car: clothes (for warm or cold weather), bug spray, sun screen, snacks, paint, brushes, canvases, frames, framing tools, etc., etc.,etc. This is my last post until I return home next week. State Parks do not have tv, telephones or wifi service. If anyone REALLY needs me call my cell or my husband and he can get in touch with me. I leave Sunday for the Wekiva Springs Invitational Plein Air Event March 1 - 6. This is one of the top paint outs in the state with over 30 outstanding artists participating. We are housed in the group camping cabins ---which cannot be confused with the Ritz--- meals are provided and a super reception and sale is given at the end. Living in a community of artists for a week must be what heaven is like. Friendships developed over the years get renewed, we "talk shop", pour over art books, paint from sun up to sundown (even later sometime) and hang out. Life doesn't get much better than that. Treat yourself and come on out to watch the artists at work. You will find no better time to add a painting to your personal collection. This weeks painting is 2"x3" oil on canvas mounted on gator board. I painted it this past weekend at the Orange Lake Overlook Paint Out hosted by Florida's Eden. Bids may be offered until 5 pm EST Monday, March 1. There will not be an auction next week because I will be painting in the Invitational Wekiva Plein Air Paint Out in Apopka, March 1 - 6. This is a super event with about 30 professional artists participating. Come on by and enjoy the Wekiva State Park and watch some of the top artists in the state doing their thing! Florida's Eden non-profit organization put on a small plein air painting event this past weekend to help introduce the public to their new Florida Guide Book that just came out and to sign up new members. I participate in most everything they do. It is such a worthwhile effort on their part to educate the nation about our wonderful natural resources here in north Florida. The cold weather took the weekend off with Saturday and Sunday being sunny, warm and beautiful. It was truly a pleasure to be outside for a change...and getting to paint in such a great spot overlooking Orange Lake. Lots and lots of people turned out enjoying the food, music, poetry reading and art. I painted a small 5"x7" painting of palm trees and shadows on the packing house wall that sold before I could sign or photograph it. Then I had just enough time to paint a tiny 2"x3" painting and got it framed in time to leave for the Morgan Samuel Price demo at my gallery. That one sold also. 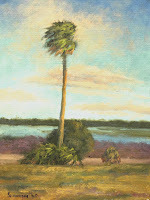 Sunday was a bit breezy so I painted a 12"x 9" painting with wind in the palms trees. Capturing the fast moving clouds and wind in the trees is always a challenge. I guess I got it right because, once again it sold very wet, off the easel along with another 2"x 3" painting. 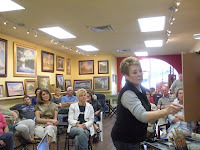 Morgan Samuel Price demonstrated her approach to plein air painting at my gallery, Voilart! Art Gallery + Studio, this past Saturday for our monthly "Coffee and Conversation" event. 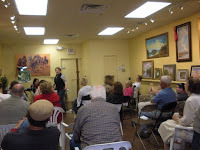 We had a large turn out of painters as well as patrons wanting to know more about plein air painting. Morgan is able to keep a running dialogue going as she paints, explaining colors, brush strokes, values, atmospheric conditions and on and one. She is a wealth of information and is willing to share all. Be sure to visit her web site for information about her instructional DVDs as well as her exciting new book. I finally got this new miniature painting posted. Sorry for the wait. Lots going on this time of year. The painting is oil on canvas mounted on board. 4" x 12" It is a plein air painting I did at the Bartram Trail Paint Out Event a few months ago. The red sail boat was fun to watch riding over the water. As always, the auction starts at just 99 CENTS!! Bids may be offered until Monday, 5 pm EST. I traveled to Deland today to pick up my painting from the Florida Museum for Women Artists. The Inaugural Exhibition has closed. If you did not see this show you missed one of the strongest, most diverse exhibits offered to the public in a long time. The fact that it was a show exclusively for women artists added to it's brilliance. I am sincerely honored to have had my work included. Wow! The sun is out!! What a great Valentines Day Gift!!! It is still cold but I can stand that if the sun shines. I am getting lots of calls from people wanting to attend the Morgan Samuel Price talk at my gallery. We are suggesting reservations in order to get a head count for chairs and the amount of coffee we need to prepare, but a reservation is not required. So, if you decide to come at the last minute...please do! The coffee will be ready when you arrive so you can stay warm and commffeee. Today is grey and drizzly. Another cold front is moving through. I may have to buy one of those artificial sunshine lamps before I go into a deep depression. Us Florida natives cannot go too long without sunshine! But onto happier thoughts. I attended a wonderful presentation last night at the Appleton Art Museum in Ocala with two good friends Margaret Watts and Nancy Moskovitz. Morgan Samuel Price spoke about her one woman show that has just opened at the Museum. She is a consumate plein air painter. Google her to find out all she has done then go see the exhibit. Her paintings capture the essence of the landscape. I have painted with Morgan in several invitational plein air events. Watching her paint---somehow I manage to set up my easel behind her---is pure joy. She is quick to find her subject, plan her painting and get it done. I am happy to announce that she will give a presentation at Voilart! Art Gallery Saturday, February 20, 4 pm. If you missed her at the Appleton be sure to be there on the 20th. "Solitary Egret" is 6"x4", painted in oil on gallery wrapped canvas, so there is no need to frame this little guy. Shipping and packaging costs are included. Please add 6% sales tax to your winning bid. Congratulations to Ronald for winning the White Egret last week! Sunday dawned overcast and cold, for us native Floridians. But, the sun broke out about 11 AM and brought the warm temperatures. All in all it was a beautiful day...which is why I am puzzled that more people did not attend the show. Saturday was definitely better attended. As on Saturday, small items sold all day long, with more conversations about commissioned paintings of favorite locations. Harry stayed with the booth for a while as I walked a couple of streets to see if anything different was happening other places in the show. But, I saw virtually no one carrying home artwork!! A few small packages here and there were being purchased but nothing big like in years past. Well, that is the name of the game. You roll the dice and hope for the best. The committee, as always, did a good job of putting on the show. People came, they just did not buy. I am not totally distressed. I have had low sales at past shows only to have a customer call me at a later date to make a purchase or to schedule a commission. So, I will keep my fingers crossed and be in the studio tomorrow to start a new painting. I was a little bummed because my booth was at the very outside perimeter of the show (# A-029) An artist on one side of me asked "are you sure we are even in the show?". But as final touches on the set-up and artwork were almost done people began to arrive...in droves...at 9 AM ...one whole hour before the show officially opened at 10 AM! We had some wind but no rain. The temperature was pleasant. All the artists were astounded at the great number of people that came and went all day long. Smaller, less expensive items were sold..which pays the bills. I spoke with a couple of people about large commissioned paintings and they even gave me their contact info, which is a good sign of their interest and intent to follow through. The first day was encouraging. I have high hopes for tomorrow!! I picked up paintings at the Backus Gallery and Picture Perfect Frame Shop and Gallery in Ft. Pierce today. Then headed for Mount Dora to catch up with my husband, Harry. By the time I got there he had already checked in for me and found my booth space. The Five o'clock set up time came quickly and so did the rain. Not much fun putting the tent up in a drizzle but we have it down to a science and got it done quickly. We were off and gone before many artists were just getting started. Now, to bed, in order to rise at 6:30 AM to head back to Mt. Dora for the show. Come on by if you are in the area!! The White Egret painting offered for auction this week February 2, is 3"x2" painted in oil. As always, the bidding starts at just 99 Cents and Shipping and Packaging are FREE. Congratulations to Joel and Frances for winning the Tabebuia Tree painting last week! They managed to post their bid at 4:57 pm Monday night, just minutes before the 5 pm deadline.